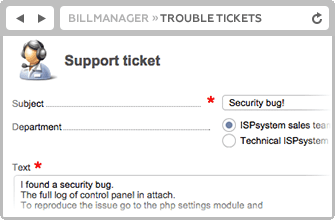 Found a bug in our software product, that is not caused by incorrect settings of your server or other factors? Let us know! We are ready to investigate it! 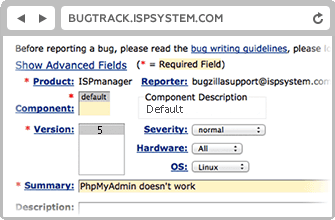 Only owners of ISPsystem's licenses can submit a bug report. 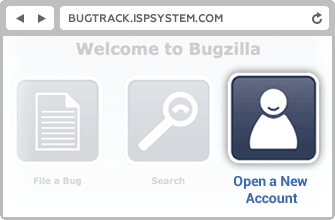 Register in the Bug tracking system. Enter the ID and IP address of your license, and your email address. Click "Submit" and select a solution for which you want to report a bug. In the "Summary" field enter a short sentence describing what the bug is about, and click on the "Submit bug" button. We would greatly appreciate accurate and informative bug reports. The more detailed information you give, the better. The system's primary function is to let us know about bugs that you found. Please use it accordingly, and take advantage of other channels to give us overall feedback. 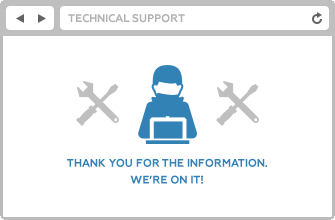 We cannot guarantee that a bug will be taken care of in a fixed amount of time. But we can promise to fix it as soon as possible. To keep our products safe and fault-tolerant, we offer rewards for critical bugs found in our software products. * BILLmanager 5 and V.4 solutions are not part of the Reward program. Bugs causing our solutions to freeze or a service to fail due to actions performed by users (not administrator) through the control panel. Security bugs enabling a user to obtain data that belong to another user. Security bugs enabling a user (not the main administrator of the control panel) to receive administrator privileges. 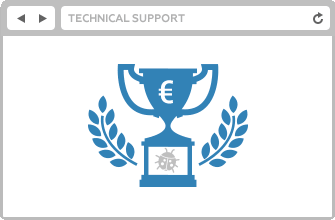 Submit a report to our technical support describing step-by-step and in detail what the bug relates to, how the issue is discovered, how the problem can be recreated by our team. Attach logs of the control panel with the maximum debugging level. 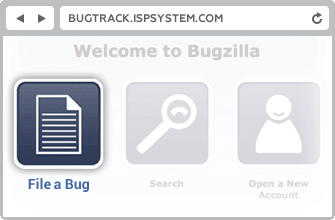 Our QA will test the bug, and if confirmed, the bug will be registered in the bug tracking system. This process may take up to 3 days. The client who first reported the bug, will be rewarded via a convenient payment method as soon as the bug is confirmed. We hope this opportunity will help to resolve problems you encounter, making our solutions even better!